Reconciliation is in the wind, a wind that is heralding change across the country. 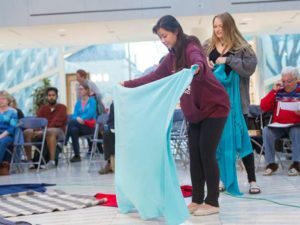 Over the mandate of the Truth and Reconciliation Commission of Canada (TRC), we listened, we witnessed powerful truths, we shared emotions, and we were transformed. Now, three years later, we need to continue to respond. Currently, the KAIROS Winds of Change campaign focuses on TRC Call to Action 62.i, also known as Education for Reconciliation. Good news! Most provinces and territories are making progress towards implementing TRC Call to Action 62.i. 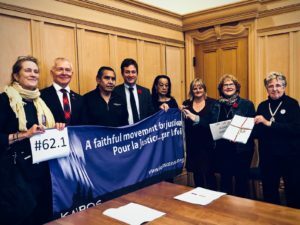 Since the release of the TRC’s 94 Calls to Action in 2015, KAIROS Canada has graded Canadian provinces and territories on their public commitment to and implementation of Call to Action 62.i. On October 9, 2018, KAIROS released an updated Education for Reconciliation Report Card, which measures the progress of each province and territory. KAIROS agrees with the TRC that education is the key to reconciliation. Without a shared understanding of how our collective past brought us to where we are today, we will not be able to walk together into a better future. Read the 2018 Report Card to see how each province and territory is progressing towards full implementation of Call to Action 62.i. Meet with your MPP/MLA and the Ministry of Education. Access details and support documents. 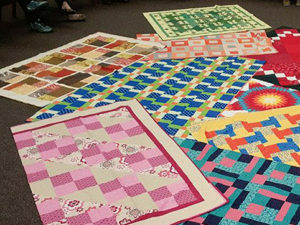 Host a workshop or event to bring the KAIROS Winds of Change campaign to your community. With education in mind, KAIROS has also advocated for implementation of Calls to Action 93 and 94 to ensure that newcomers in Canada learn about the history of Indigenous peoples and Treaties (Call 93), and to revise the Oath of Citizenship to include the Treaties among the laws to observe in Canada (Call 94). KAIROS looks forward to the full implementation of Call to Action 93 and 94. As the Winds of Change campaign progresses, KAIROS will focus on additional Calls to Action. Together, we can change the education system and help transform Canadian society. We have momentum to build on, thanks to those who have come before us: residential school Survivors, activists, organizations, educators and others who have for years been calling for every student to learn the true history of Indigenous peoples in Canada. Thank you also to those who signed petitions, had them presented in legislatures, and met with elected officials and policy advisors. Your actions have had an impact on strengthening reconciliation through education. Join the Winds of Change campaign and be a voice for reconciliation through education!